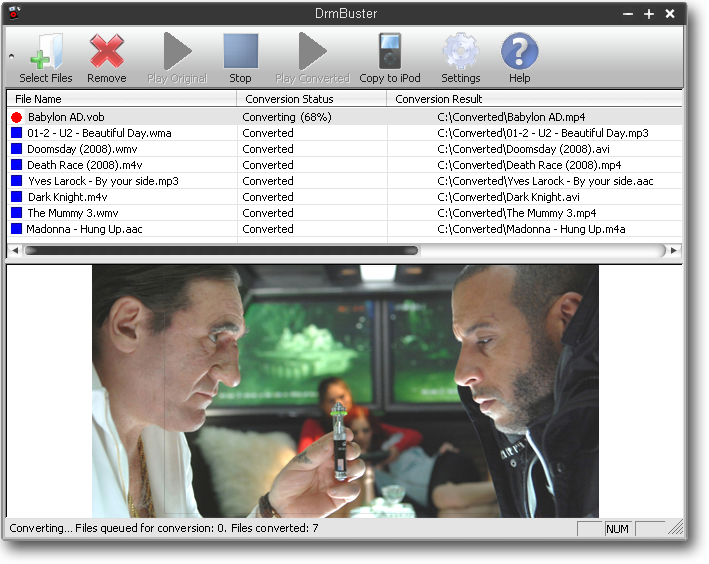 With DRM Buster converter you can enjoy any purchased or legally obtained song or movie on your iPod, iPhone, Zune, any other MP3, MP4, DivX or DVD player, CD player, car audio & video, mobile phone or PC - without any restrictions and DRM protection. For example DRM Buster can convert WMV movies from CinemaNow with original video quality; rip protected music and video files from iTunes (M4P, M4V); Rhapsody (RAX, WMA); Napster To Go (WMA), Yahoo Music (WMA), Audible (AA), Sony CONNECT Music (ATRAC) etc. One-click conversion feature will convert WMV videos with original picture quality and desired video resolution. The only condition is that all media content can be played on the computer where DRM Buster is installd. Converted songs and videos have NO restrictions anymore! Qweas is providing links to DRM Buster 2011 as a courtesy, and makes no representations regarding DRM Buster or any other applications or any information related thereto. Any questions, complaints or claims regarding this application DRM Buster 2011 must be directed to the appropriate software vendor. You may click the publisher link of DRM Buster on the top of this page to get more details about the vendor.